Bank holiday Monday and visitors are flocking to town, in search of a little sea air and a break from the hustle and bustle of everyday life. Among these visitors are Roy and Liz Catlin and their young daughter Rowena. The Catlins haven’t just come for the day though. They are on holiday and will be staying until Saturday. The fair has come to town as well, bringing with it all of the usual shows and rides that you would expect from any fair. There is a shooting gallery and a rollercoaster; there is a ghost train and merry-go-round. There is even a menagerie and, at Schaefer’s fair, they have a fortune teller too. Her name is Jane and she works in a little tent. Jane isn’t a gypsy, she is a Red-Indian squaw who has a talent for wood carving and making strange totem-like dolls. Rival biker gangs have also made their way to the town, but they are searching for a little more than just the sea breeze and the only break that they are interested in is the sound of breaking bones. The main characters in Manitou Doll are the Catlins. Roy and Liz Catlin don’t enjoy the happiest of marriages and it is Liz who seems to be the dominant force in their family. While they are on holiday Roy attempts to be a little more assertive, but he has probably left it much too late. Rowena has hearing difficulties, but she is a happy enough child and she loves the fair, so, on their first evening, that is where the Catlins go. By then the bodies of the dead and injured have been removed and things seem to have calmed down a bit. Rowena wanders away from her parents and enters Jane’s tent. Jane and Rowena strike up an instant friendship. Liz disapproves of the friendship and tries to discourage it, but her daughter keeps sneaking off to see her new friend. When Jane carves a wooden doll and gives it to Rowena, Liz is horrified. It is so ugly. And the eyes! They look evil. Rowena loves Doll though, and soon finds out that there is a lot more to it than just carved wood. 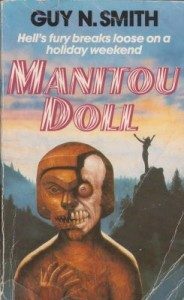 I enjoyed reading Manitou Doll and found it to be quite an unusual story. I must mention, however, that there are some rather violent scenes early on in the book, one of which involves a very young child. It is such a well written scene that it might upset some readers, which is why I mention it now, but I must stress that nothing of this nature is repeated later on. I have to say that Mr Smith has a real talent for creating dark characters and making them believable. One of the bikers, Fat Fry, is a really nasty piece of work and the scenes that are written from his perspective place the reader inside the head of a man capable of extreme violence. Not all the characters in Manitou Doll are as dark and nasty as Fat Fry, however. The Catlins might have their problems, but they are nice people, even if Liz is hard to warm to. Jane is quite a likable character and Doll . . . well . . . you will have to find out about Doll for yourself, by reading the book—or not—the choice is yours.